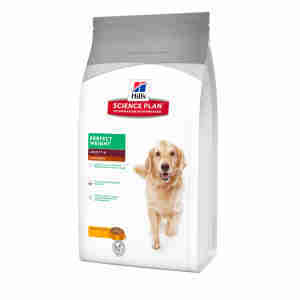 Hill’s Science Plane Canine Adult Large Perfect Weight is recommended for large breed adult dogs that are slightly overweight or with a tendency to gain weight, from 1 year (i.e. dogs that are less active, neutered or otherwise prone to being overweight). Hill’s Science Plan Perfect Weight has a unique blend of ingredients and low fat content. Formulated to help your dog achieve healthy weight for longer life expectancy. Please click below to download the Hill’s Perfect Weight Calendar, a fun and practical tool to help keep track of your pet’s weight loss over 10 weeks. I have been using Hills Science Plan Perfect Weight for a year or more. My Golden Retriever has a sensitive digestion but this suits him, he likes it and it keeps his weight stable as he is prone to putting on the pounds! Would recommend this food. Great food. Help my dog lose a few extra pounds not needed and helps maintain good weight.